There are good reasons why you probably don't often come across productions of Leonardo Vinci's Artaserse. Written in 1730, there are the usual musical questions to resolve in how to approach old music played on period instruments as well as the challenges in how to present and stage a rare piece in a way that gets the full impact of the work across. Vinci's Artaserse however is even more rarely performed since it requires no less than five countertenors to sing the extravagantly arranged castrato roles of the work. And not just any five countertenors (although it's not as if there are that many to pick and choose from), but you really need five of the best in the world to be able to do any kind of justice to this particular work. Which is exactly what makes the Opéra National de Lorraine's 2012 production of Vinci's Artaserse such a unique and thrilling experience. Musically, it's in the hands of Diego Fasolis and the Concerto Köln, while the casting brings together the extraordinary cast of countertenors Philippe Jaroussky, Franco Fagioli, Max Emanuel Cencic, Valer Barna-Sabadus and Yuriy Mynenko, with the addition of tenor Juan Sancho in the work's only other singing role. It's such a rare gathering that this team toured the opera around France and Europe in concert performances, even making dates in the UK, but this performance recorded here at Nancy offers the opportunity to see the work in a full theatrical staging, and it really is something else. The direction by Silviu Purcărete plays on what is undoubtedly the unique selling point of this version of Artaserse as being possibly the greatest showcase for the divas of early opera, the castrato. With its extravagant costumes and five lighted theatre make-up mirrors placed to the sides of the stage, there's a lot of preening and posing on the part of all the leads, but there's more to this than just showmanship. It's always a challenge to make a Baroque opera lively and visually engaging, and this one does it by representing its extravagance and its heightened theatrical qualities. Naturalism is not an important factor here. And nor should it be in a work based on a Metastasio libretto. Artaserse is a typical work of the poet, based around a ruler who has to do the right thing and put aside or reconcile his own feelings in relation to various dilemmas over love and duty. It's a work that has been adapted many times, but depending on whose version you listen to and who is adapting it, it can still be fairly dry material by today's standards. 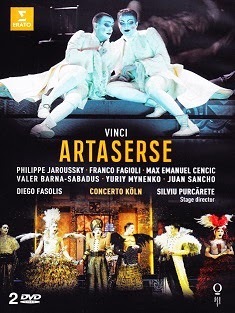 The music in Vinci's Artaserse is exquisite - and it's marvellously played here Diego Fasolis conducting the Concerto Köln from harpsichord - but perhaps not so much that it stands out from other settings of the work or indeed other opera seria works like it. What makes Vinci's version extraordinary is indeed its setting for five countertenors. That is what is so impressive about it, and when it has singers of sufficient calibre, it raises the work to another level entirely. Despite the best efforts of the production team and singers here - and truly it's hard to imagine a better line-up - it can still be a struggle to engage the audience in the drama of Artaserse. 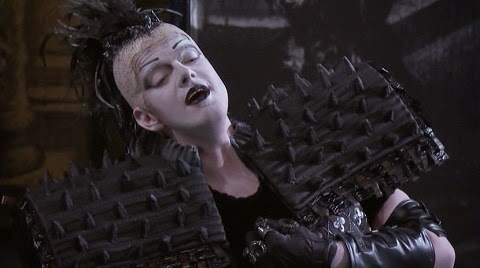 It's certainly not a fault of the production, which achieves a good balance between simple theatricality and visual extravagance in the costumes. A simple revolving platform even saves the performers having to move around much, leaving them free to express the drama and emotional turmoil principally through the singing. There's recognition then that it's the singers and the singing that you're here to see, and that seems to be more than sufficient in this case. The arias and ariosos are not long-winded or overly ornamented, but they are demanding nonetheless and really require virtuoso control. Each role moreover clearly has been composed for a specific type of countertenor voice. Whether the singers here have been cast in the right voice in musicological terms I couldn't say, but they seem perfectly fitted here for the roles they are in. Admittedly, it can be difficult to distinguish who is who with all the outlandish costume changes, wigs and face-paint - to say nothing of the difficulty of determining role gender - but every single countertenor voice here has their own unique sound and character, and each are outstanding within the role they play. Some evidently have more demanding parts than others because of the emotional turmoil they undergo. Arbace has arguably the most traumatic dilemma, consumed with guilt over the fact that his father Artebano has killed the king, Serse. Accused of the murder himself, he's prepared to suffer the consequences in silence, without condemning the real culprit, and Franco Fagioli is outstanding in how he plays out this inner turmoil. It's Philippe Jaroussky as Artaserse however who has to balance the sense of friendship and fairness in dealing out justice with the shock of his father's violent death, knowing that much lies in the balance. The romantic complications of Semira and her conflicted sentiments would seem less important, but Valer Barna-Sabadus' astonishing delivery will convince you otherwise. This is where the real quality of Metastasio's libretto shows, giving each characters the opportunity to express their sentiments in such a way that the listener is swayed between them and sympathetic to their plight. If you've the right singer in those parts, the effect is even more pronounced, and that's the case here with Max Emanuel Cencic's Mandane, with Yuriy Mynenko's Megabise and even with Juan Sancho's Artebano. Every role is superbly cast and exquisitely sung. The theatricality of the staging is emphasised by the manner in which this performance is recorded. Aside from the dressing-room mirrors at the side of the stage, the camera occasionally follows character exits backstage, or shows them preparing for their entrance, adjusting costumes behind screens that are being wheeled across the stage by stage-hands. Some might find this distracting, but as I said, naturalism isn't really what Artaserse is about, and there's no attempt by the stage director to make it period or authentic either, so this just extends this concept further. Visually and conceptually however, it holds attention, and that's what is important in presenting Baroque opera. In the absence of a Blu-ray release, the Erato DVD presents the work relatively well if all you are interested in are the basics of the performance. In terms of technical specifications however it's well below the standard of what is more commonly offered for opera on Blu-ray releases. The image quality is clear and stable, perfectly fine for Standard Definition with the performance spread across 2xDVD-9 discs. The audio mixes are LPCM Stereo and Dolby Digital 5.1 in 48kHz/16-bit, the sound clear and bright with natural stage echo preferred over pristine clarity. The DVD is region-free, the subtitles English, French, German and Italian. And that's about the best you can say about this release. There are no extra features, there's no booklet, there's no synopsis - nothing. For such a rare work as this, staged so well and unlikely to be revisited anytime soon, that's very disappointing.